Monthly visits to get your braces tightened or adjusted may not be the most favored part of having braces, but it is necessary none the less. In fact, if these appointments never happened, your orthodontic treatment goals would never be achieved. Besides making time in your busy schedule to stop in for an orthodontic visit, it may also be frustrating to deal with the soreness that comes with the braces tightening. However, there are some things you can do to prepare for your braces tightening visits, from alleviating your soreness to keeping in mind that the discomfort is an indication that your braces are actually working! 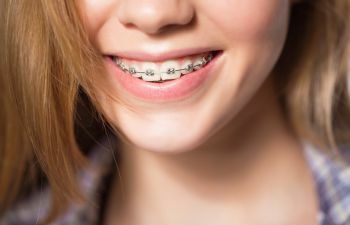 What Happens During Braces Tightening? Braces, and other types of orthodontics, are designed to move your teeth into a new (and better) position for a straighter smile. The archwire is the metal wire that connects each bracket across your teeth. During your routine office visits, we will adjust, tighten, bend or replace this wire as needed according to your specific case. However, the wire will then strain to return to its initial position and place gentle force or pressure on the teeth in doing so. This encourages your teeth to shift into position. When teeth change locations, it impacts blood flow, which often triggers an inflammatory response and pain. Sore teeth are an indication that your teeth are working towards a straight and beautiful smile. It is important to keep this in mind when you are feeling frustrated or discouraged about your dental discomfort during braces. Another healthy mindset is to remember that it is temporary. Patients may only feel mild soreness and other may experience enough discomfort that they need to resort to soft foods. However, in the majority of cases, this discomfort after a braces tightening appointment will dissipate within hours or just a few days at most. In addition, after the first six months, these routine visits will gradually cause less and less soreness. Need more tips on caring for your mouth after braces tightening? Call Georgia Orthodontics & Children’s Dentistry. We do everything we can to make your orthodontic experience comfortable – we promise the end result is worth it!